How can a personal trainer in Dubai help you achieve your fitness goals? How can a male or female personal trainer in Dubai help with your health, lifestyle and fitness goals? Every time you walk into the gym in Dubai you’ll be greeted with a variety of posters advertising all of the services the local personal trainers can offer. Everything from extreme fat loss to dramatic muscle gain in just a matter of weeks. Today, we’re going to look at everything to do with hiring a personal trainer in Dubai and why it could be one of the best investments you’ll ever make. What is personal training in Dubai and how can a PT or fitness coach help you? Simply put, personal training is where you hire a trained health and fitness specialist to help you to reach a specific goal. Whether that is to lose fat, gain muscle, or simply become fitter whilst increasing your awareness of your health. 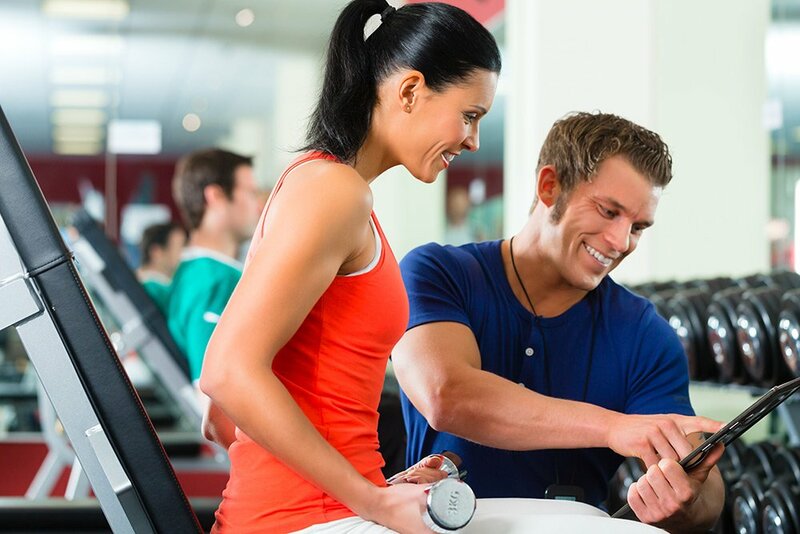 Personal trainers will then design you a workout plan, diet plan or both as well as taking you through workouts. Some services will simply design you a plan whilst others will include workouts with the trainer themselves. Why do People Use a Personal Trainer in Dubai? There are a variety of reasons why people tend to hire a personal trainer in Dubai in the first place. However, by far the most common is because people want to change how they look but they don’t quite know how. In the modern age, there’s an endless amount of diets and exercises methods all claiming to the best. Yet, what ends up happening is that people fall off the wagon as the diet is either too restrictive or they just don’t enjoy it. A male or female personal trainer local to you in Dubai works with you specifically to find out what suits you in terms of your preferences and fitness goals. How do Personal Trainers & Fitness Coaches in Dubai Create My Plan? Using their health and fitness qualifications and experience, a personal trainer will begin by working out what you want to achieve from their services. So, it’s important to have a clear goal that you’re trying to attain. Although, personal trainers and fitness coaches can also help to clarify what you want as it can sometimes be hard to work out exactly what you want to achieve. From here, they’ll assess your base level of fitness by most likely finding out your weight, BMI, and previous experience in relation to your diet and exercise. Other things they might test are your strength levels in certain movements, blood pressure, resting heart rate, and VO2 max. When it comes to your initial PT consultation, the more information you provide, the better your results will be. There’s no point in lying about your experience and eating habits as that will only hinder the effectiveness of the trainer and the time it takes for you to get results. You’re more likely to commit yourself if you’ve had to spend some money to get help. Buy In can come in more forms than just money, though. Buy In can also mean that you have a deadline (such as a wedding or holiday) to get ready for. In terms of personal training, simply spending money can mean that you’re going to want to get the most out of their services as otherwise you’re just wasting finances. One of the best things you can do to help you stick to your journey is to exercise with someone else as then you not only have the risk of letting yourself down, but someone else, too. You can think of a personal trainer in the UAE as an extremely knowledgeable workout partner who’s as invested in your success as you are. As well as this, the progress you make with a PT is motivating enough in itself. Hiring a personal trainer takes some degree of your journey out of your hands. Knowing that all you need to do is stick to the plan that someone else has designed in order to get results will give you both focus and confidence. Once you’ve got a PT, you no longer know that you’re spinning your wheels and you can fully trust in the process. Letting yourself down might make you feel bad, but at least you know that nobody else really cares or even has to hear about your failure. Hiring a personal trainer means that there’s someone else you have to talk to about what you eat and how you perform. Lastly, possibly the biggest and most obvious benefit to taking on a personal trainer in the UAE is that you’ll actually make the progress you’ve wanted to make for years. Not only this, but you’ll make the progress far quicker than you would have otherwise going at it alone as well as learning some valuable information along the way. Personal trainers don’t just teach you the things you wanted help with, they teach you far more valuable things you didn’t even know you wanted to know to help with your fitness in the future. At the end of the day, your health and fitness should be the most important thing in your life. Beyond looking good for summer or trying to impress someone, your mental and physical health can really benefit from a personal trainer. Even if you think you’re doing alright by yourself, hiring someone whose sole job it is to make sure you move forward can make a dramatic difference to your mood, confidence, appearance, and physical performance. The UAE Personal Trainers website can help you start your fitness journey with ease. You can easily and quickly find the right male or female personal trainer in your area of the UAE and get on the road to a fit and healthy lifestyle.